REDFIELD PROCTOR was born in Proctorsville, Vermont, on 1 June 1831; was raised by his mother after the early death of his father; received his bachelor�s degree from Dartmouth College in 1851 and his advanced degree in 1854; married Emily Dutton, 1858; completed studies at Albany Law School in 1859 and entered practice with a cousin in Boston until the outbreak of the Civil War; enlisted as quartermaster of the 3d Vermont Regiment in 1861; was promoted to major in the 5th Vermont Regiment; contracted tuberculosis and was ordered home in 1862; pursued an outdoor life that restored his health; commanded the 15th Vermont Regiment in the Gettysburg campaign; returned home to form a law partnership in Rutland, Vermont, with Wheelock G. Veazey; was elected to the state legislature, 1867 and 1868; was appointed receiver of a small marble company at Sutherland Falls, 1869; entered the marble business; moved to Sutherland Falls; served in the Vermont Senate, 1874�1875; served as lieutenant governor of Vermont, 1876�1878; served as governor of Vermont, 1878�1880; became president of the Vermont Marble Company, 1880; headed the Vermont delegation to the Republican national convention, 1888; served as Secretary of War, 5 March 1889�5 November 1891; revised the military justice code, instituted a system of efficiency records and promotion examinations for officers, and established a single record and pension division in the department; was elected to the U.S. Senate and served from 1891 until his death in Washington, D.C., on 4 March 1908. Robert Gordon Hardie (1854�1904) was born and died in Brattleboro, Vermont, and was thus a logical choice to paint one of the state�s prominent citizens, Secretary Proctor. He studied painting at the Cooper Institute and the National Academy of Design in New York, and under Jean Léon Gerôme in Paris, and was elected to the Society of American Artists in 1879. 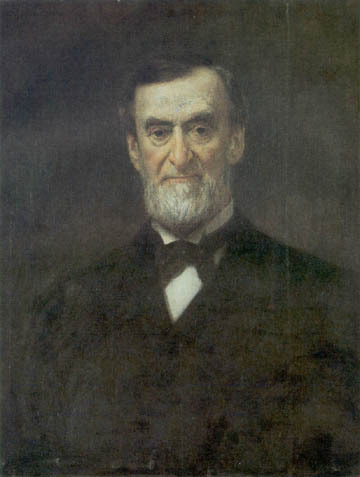 Hardie painted Secretary Proctor from life shortly after Proctor resigned from the War Department post to succeed George Edmunds in the United States Senate.